Unusual mediaeval mapping of creation. 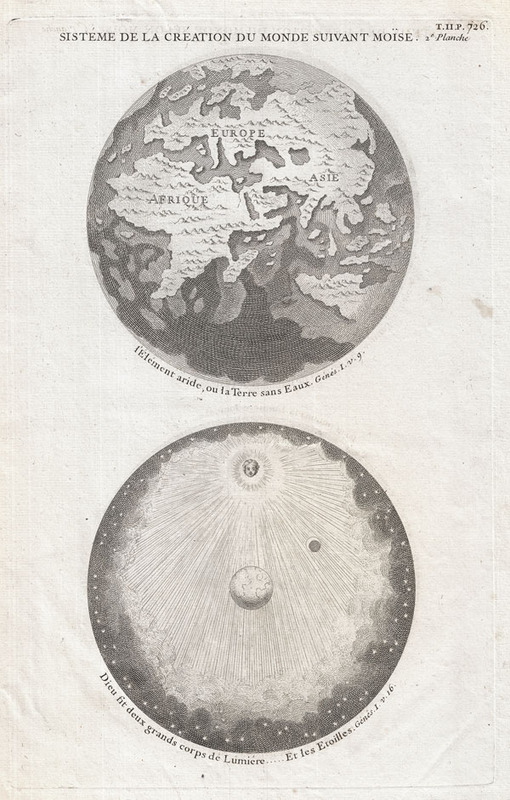 A curious c. 1728 mapping of the ancient world and the cosmos rendered from an arcane Biblical perspective. Though composed well after the discovery of the New World and the circumnavigations of Magellan and Drake, this two part diagram represents a very medieval view of the world. The upper map, though ostensibly the Eastern Hemisphere, actually follows a medieval doctrine advocated by Francis Bacon. That is, the belief that the physical earth was large ball of rock resting within a great sphere of water. The habitable lands of the earth, Asia, Europe, and Africa, were pieces of this rock that emerged from the waters when God caused the ball of rock, Earth, to float in the northern part of the watery sphere - much as a baseball might float in a bucket of water. This argument was used in the middle ages to prove that the antipodes, or the lands south of the equator, must not emerge from the sea, for necessarily, if the earth is floating at the northern part of the watery sphere, the southern parts must be covered fully by deep seas. Hence the darker shading, indicating fathomless depths, in the southern parts of the map. The lower sphere depicts the cosmos from a pre-Copernican perspective. Earth rests at the center of the universe, around which the Moon, Sun (here drawn as benevolent God), and the stars rotate. The curious diagram was included in Augustin Calmet's influential 18th century Biblical dictionary. Calmet, Augustin, Dictionnaire Historique Critique, Chronologique, Geographique de la Bible, 1728. Very good condition. Original platemark visible. Wide clean margins. Blank on verso.